Ever wish you could double up your recreation time? You know, accomplish other things while spending hours on end riding? Charge your Garmin, capitano, because here's how to be a tourist without compromising your riding. Before the unification in 1861 led by Giuseppe Garibaldi, Italy was divided into its towns and regions. You'll see a Piazza Garibaldi in nearly every Italian town for this reason. Now, in modern-day Italy (if you can say such a thing) these towns are connected by TrenItalia, Italy's national train operator. Most regional or intercity trains have a car dedicated to bikes: either the first car or the caboose. Say Strava was to create an "Italian railway" heat map, its reach would put North America's Greyhound bus line to (additional) shame. Today's cycling destination is Florence, roughly 125 km from Lucca with a total elevation suitable for people who don't object to climbing. If you do object, I would recommend a city bike in Lucca where you can park it, lock it and visit museums like a civilized human being. For the rest of us, recognizable by horrific tan lines, let's kill two birds with one stone. With a gelato selection of cycling routes to Florence, I usually take flat main roads for the first 25 km otherwise you may as well arrange a coffin for your arrival. But, trust me, you can crank up the climbing to your heart's desire. There's a mountain range from Montecatini Terme that runs down to Florence and a series of roads with four virgin Mary’s that take you along and over it, past Vinci near where Leonardo da Vinci was born. Leonardo's hills are in a constant state of flux as local pedalers enter and exit this heaven on two wheels. Monte Albano's beauty not only lies in its olive orchard framed roads, but the views of the valley laid out below. When the going gets tough, you'll have panoramic views carrying you along. This ride's difficulty isn't for long climbs but unrelenting short ones. At about 40 km, still at sea level, you might consider Il Re del Cappuccino, the Cappuccino King and for good reason. He's since transitioned from form to formless leaving behind a patrimony of cycling paraphernalia: signed jersey's, albums of photos and signatures of each and every cyclist drawn to his shop through a shared passion for suffering. This bar puts their same love for cycling into making some of the fluffiest cappuccino's I've seen. And now, quite literally, onwards and upwards. Nothing worthwhile comes without a little elbow grease and the incoming vista over Florence is just that. But this is the prosciutto, and we haven't won the Granfondo just yet. So hang tight, and I'll tell you where to stop for lunch. Until you've reached the Renaissance city, you'll be on roads with limited commercial distraction. So be diligent in researching the right place, and Artimino at 85 km has two conveniently located restaurants worth the effort climbing an extra kilometer or two. From there it's 35-40 km until you'll see Florence's majestic cupola and cathedral prominently above its surrounding terracotta roofs. Streets lined with tall stone walls in the neighbourhood of Arcerti, where Galileo Galilei spent the last few years of his life will formally introduce you to Florence alongside Piazzale Michelangelo. I highly suggest you take in the views from Piazzale Michelangelo then descend to one of the Arno's parallel roads toward Ponte Vecchio. Some other must-sees by bike are Piazza della Signoria (with the statues), Cathedral di Santa Maria del Fiore, and Piazza Santa Maria Novella. When you're ready to return, get a single train back from Florences' central station, Firenze S.M. Novella. Insider tip: download the TrenItalia app on your phone to see schedules while eating your second lunch. Or first dinner. Or third gelato. You get the picture. Nota Bene: Do not leave your bike unattended anywhere near or in Florence. Bike theft is an organized crime in major cities. Bring a lock or ask somebody trustworthy to keep their eyes glued to it. Does cycling to Florence sound interesting to you? 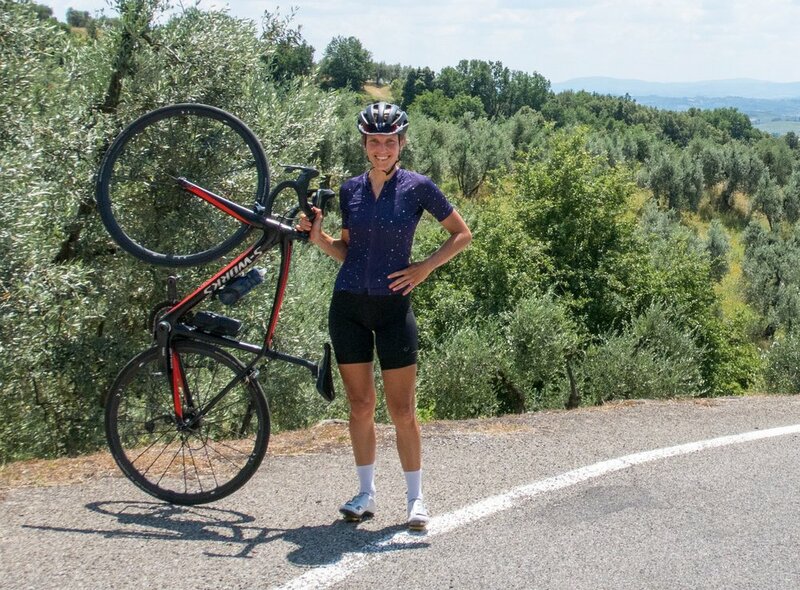 Do it with me and make your transitions from bike to pizza to Firenze centro to train seamless or on your own by contacting me for the free gpx route.